“This Dakar has been a tough one, the body is definitely feeling very second hand,” says current Cross-Country Rallies World Champion and the most epic winner in Dakar history. Toby Price did the impossible: He endured the insane pain which drove him crazy, and occasionally having to rev the bike with his left hand. There were moments, especially in the stages 3 and 7, when he already felt beaten; the win was far away on the other side of pain. After ten bloody battles, he won the war with inhuman will, and consistency. “I am so glad I didn’t give up,” said Price after crossing the finish line. 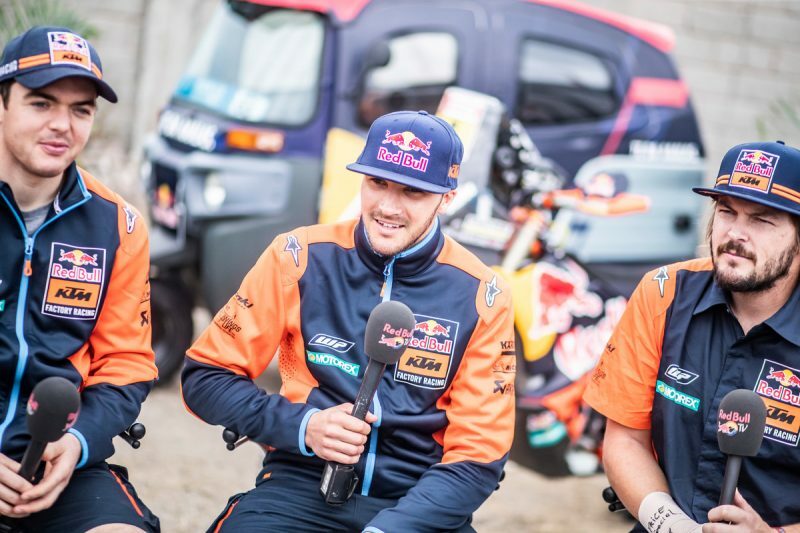 On the rest day in Arequipa, the 2016, 2017, and 2018 Dakar winners of the bike category, who would later finish on 1-2-3 spots of the podium, were being interviewed by several media. There were a lot of laughs and banter, even though none of them believed they could win this year. Despite sitting in 2nd place of the general standings, Sam Sunderland had to open stage 6, and that meant a sure loss of time. Matthias Walkner was 7th overall, Toby Price 4th, and all three were carrying injuries. It indeed has been a very tough one, and that’s why we did a special debrief, asking them how they would unwind afterwards. He broke a bone during his first slightly more daring motorcycle race, rolled his car in his first 4-wheel race, and, maybe it’s a good thing he is not flying planes. The latest price he paid was a broken scaphoid, a souvenir from the final test last December. The injury was far from healed when on January 1 he boarded a plane to Lima. Like a casino gambler who beat the dealer, he grabbed the jackpot. We were sitting in a hotel in Lima after the Dakar celebrations, when he said: “Back home, I am going straight to the hospital first, that’s pretty much my second home.” His doctor would later tell him the bone was about to collapse, and another screw was needed. “There is a question mark hanging over the trip I have already organized. I should go to Vietnam with my family and friends, but unfortunately this is a motorbike tour we are talking about. In the land of old Chinese bikes I would ride a KTM 690 ENDURO R, and I am so excited about that. If everything goes well with my wrist, I will soon check off my bucket list the second biggest cave in the world, and a golden bridge held by big rocky hands. Though the best of all is that I am gonna have a KTM motorcycle, hoping to get some pretty amazing footage and some cool stuff for my vlogs. From there, I don’t know exactly, but for sure I will book a holiday also on my own, some nice place with white sand and crystal water, where I can drink from a coconut and let my body recover,” he explained his plans. 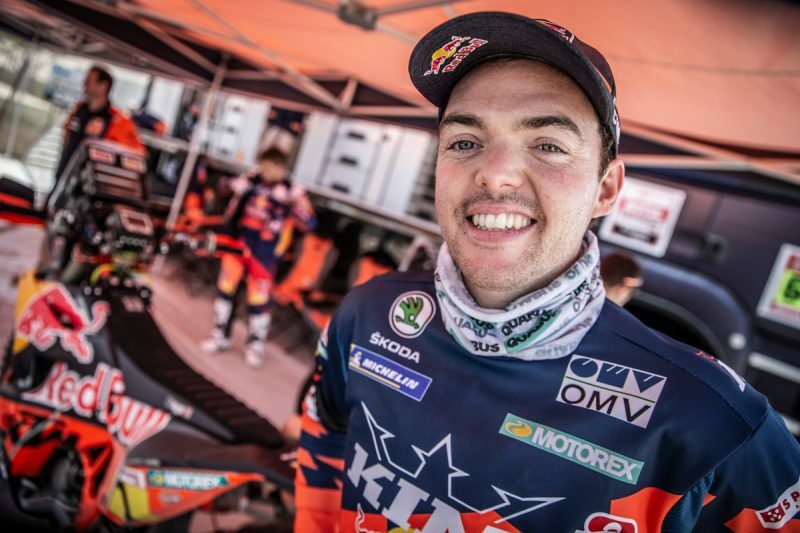 Hurting his ankle in the 5th stage didn’t slow down the 2018 Dakar winner. 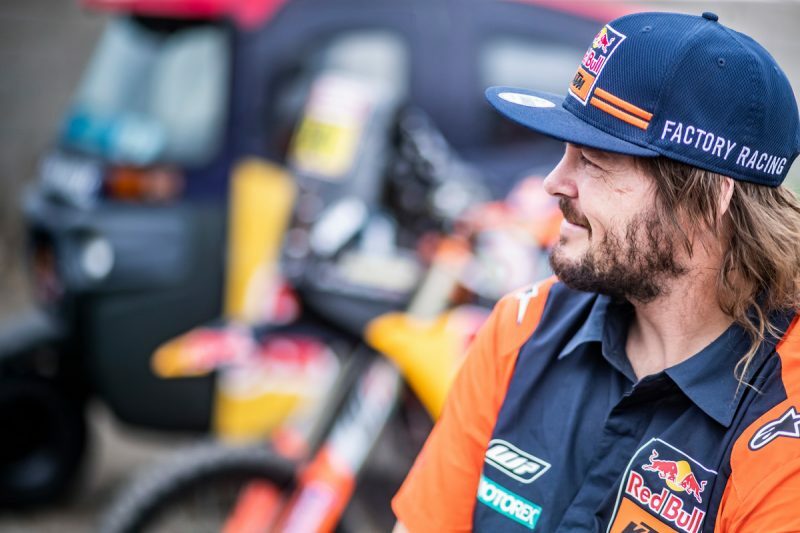 Shining on the toughest stages where riding and navigational skills were fundamental, Matthias Walkner finished the 41st Dakar edition as runner-up. Even though he didn’t win, he is convinced he rode his best Dakar so far. 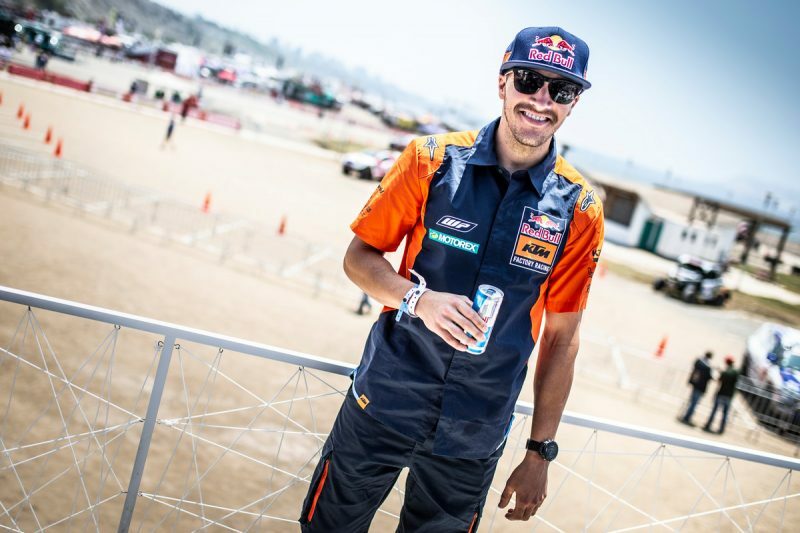 “Now I deserve to party a bit, because I worked really hard for this Dakar. It’s not easy to start with number one, it sure adds extra pressure,” he admits. But since there are some medical issues on his to do list, party time will be short and sweet. “In my first two weeks back I’ve got some press stuff to attend to around Austria, and to cheer on my friend Marcel Hirscher.” At the end of January Matthias went to one of the most famous downhill ski races in Kitzbühel, before visiting the night race in Schladming. “This is what helps me relax, watch a good ski race and hanging out with friends.” At the time of writing, Matthias already successfully underwent knee surgery, and is waiting to have the pin taken out of his femur. “It’s going to be three or four months of recovery, and then, in the summer, I hopefully will be ready to race again, at least on two wheels,” the car enthusiast explained. The last Dakar came with a special prize, a brand new KTM X-BOW, and now it’s the time to take it onto the racetrack. This year’s Dakar was a bit of a rollercoaster for the 2017 Dakar winner Sam Sunderland. Only on the last stage he was granted the removal of the one-hour penalty issued for missing the start of stage 8 and was promoted to third place. “This Dakar was really, really tough on every level: physically, mentally, and emotionally. I had so many ups and downs, that I feel completely drained. Drained, but happy, we could say, because obviously this is a big achievement for KTM. On day 8 it still didn’t look like it would happen, we fought till the last meter. The top ten riders were really strong, and it wasn’t clear which one would dominate. It was more about who would make the least mistakes. Saying that, I feel really tired and just want to relax. I want to go home, and finally see my dog. He’s with some friends now, but I know, he misses me likewise. Everybody loves Oli,” he smiles and adds: “Wouldn’t hurt to spend some time with my girlfriend too, to go for some nice food and just be together.” Otherwise Sam confesses he has a bit of a bad habit. “I play too much PlayStation, with teenagers over the world. I know it’s not very healthy, but it’s my way of relaxing. Of course, nothing compares to walking Oli in the beautiful Andorran mountains. I am happy to have moved here to live, the nature here is truly amazing. Besides that, Andorra it’s close to Spain, if you want some extra sunshine,” says a citizen of the world, while he prepares his ticket to Paris. One Response to Race hard, play hard, chill out hard – it’s rally style!